Play with tradition or play by the ear. The love of fashionistas and celebrities alike, Ear Cuffs have made their mark in social gatherings and international runways. Contemporary ear accessory, the Ear Cuff is quite a statement for occasions that demand a neo-experimental look as against conventional earrings that sit pretty on the ear lobe. Indian culture has brought beautiful modernized and ornate Ear Cuffs that have become a legacy. Whether it is the ear-hugging elongated earrings hanging from the lobe to the helix or dainty hoops, Ear Cuff has emerged as the ‘it’ jewellery since the times of Hollywood celeb Elizabeth Taylor. With Bollywood fast catching up on this riveting look, made all the more ‘bold’ by actor Vidya Balan in one of her fashion show appearances, there can never be an end to this fascinating and loved ‘all ears’ tradition. There is an air of elegance in this on-trend ornament. Sometimes yellow gold and diamonds are crafted to perfection and sometimes imitation jewellery delivers more as a fashion-have in Ear Cuffs. 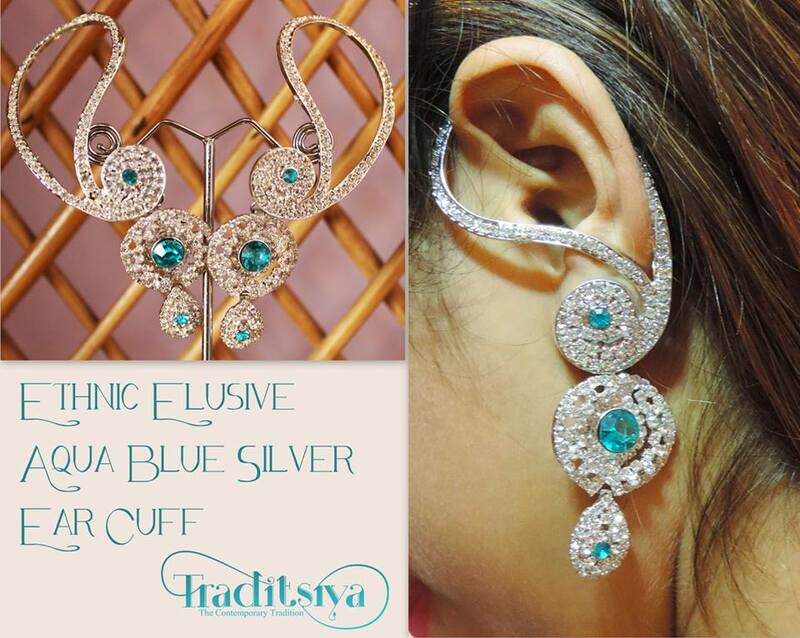 Traditsiya, a fast catching up online portal that exhibits both contemporary as well as traditional designs of Indian Ethnic Wear and Jewellery for Women brings a sneak preview of these ornate Ear Cuffs. Log onto the recommended websites and take your pick of the finest glam items we have to offer for your lovely ears. Make this gorgeous green peacock tell the story of absolute charm on your ears through the fine craftsmanship done detail by detail. The hanging drop supported by pearl almost reminds one of the peacock feathers that are a precious collectible item. To shop, click here. Beauty comes in sync with harmony with this silver overall dangler having green stud in the center that travels all along your earline down to the lobe dramatically. It is reminiscent of the Ear Cuffs worn by Begums in the ancient times. To shop for this pair, click here. Classic meets contemporary in this elusive blue and silver stone pair of studded earrings. Two rounded ovals lead to the third booti-shaped dangler at the bottom. With bent arches going around the ear, this figurative design is an ode to the tradition of yesteryears. To shop for this pair, click here. Look an ornament of regality yourself in this stunning pair of ear danglers made with red and green stone that match well with an Anarkali suit or a Lehnga. Breathtaking is the word in this color contrast making this dangler suitable to be clicked as you walk down the red carpet. To shop for this pair, click here. Green garnet-shaped studs with green droplet drooping below and maroon one-piece stone behind the ear. Subanallah….And rightly so, looking at the esteemed beauty and finish of this Ear Dangler. To shop for this pair, click here.